Well, a few weeks ago another attempt was made by Mahaney to resuscitate his struggling conference career. This time a friendly, intimate audience of about 100 young people of Sovereign Grace Church of Gilbert AZ was chosen as the target audience. You may recall how, in the past, Mahaney has praised pastors for the hours and hours they spend in sermon preparation. I highlighted that this seems not to be the case with Mahaney as these days he seems to prefer to regurgitate sermons from memory which he has delivered numerous times in the past. Well, maybe this time would be different. Mahaney has been stripped of his leadership of the Sovereign Grace denomination, his only real duty these days is to pastor a church of about 60-80 people, and for this small congregation he has 3 other assistant pastors to help shoulder the load. One would think he would have plenty of time for prayer, bible study and sermon preparation. Apparently not. The time pressures on the guy must be more intense than us common folk can grasp. Rather than prepare a unique sermon, tailored specifically for his audience of young adults, C.J. reverted to his bag of canned sermons and pulled out a few of the “old faithful” that he knows so well. If you would like to access the above page to listen to the sermons you can click here. The first sermon was on Jude 1. You can listen to the same sermon, nearly verbatim, at the links below. The second sermon was based on Psalm 88 and is also well rehearsed by C.J. He has undoubtedly preached it numerous times, below is evidence of his having delivered it on at least two other occasions. Let’s hope the usually cash-starved college-aged kids in attendance didn’t have to pony up too much cash to listen to sermons that can be found all over the internet. I would be remiss if I failed to mention that C.J. Mahaney stuck around after the conference to preach at Sovereign Grace Church of Gilbert on Sunday morning. (I wonder what the honorarium fee was?) Did he have a fresh word from the Lord for the good people of Gilbert? What do you think? Very sad. What happened to waiting on God for what He wants to say to the people? Great pickup. Mahaney is going down the tubes. He is constantly brown nosing Mohler. Have you seen the stuff in his tweets? Why does Mohler put up with this stuff. Is he that insecure that he will take anything that he can get? BTW-how do you do the audio insert? You are far more proficient than I am. Good point about C.J. Mahaney reusing old messages. I have noticed that at least some of the messages he gives at SGM Louisville are also recycled messages. One thought that someone shared is maybe like with Samson God has in effect “departed” from C.J. Mahaney and C.J. and those around him don’t know it yet. Thus C.J. isn’t able to come up with messages like he was at one time. One the other hand it could just be laziness. Maybe C.J. is just biding his time till he can retire. Thanks for the comment Steve. I am inclined to agree with your thoughts about C.J. 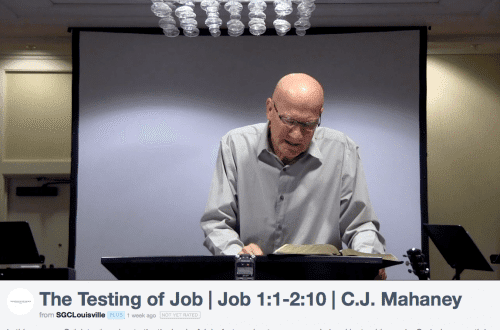 Mahaney re-using his sermons again and again being akin to the Holy Spirit having left Samson. I think Mahaney knows this and it seems obvious to those of us no longer enamored with the man. Those still worshipping the man have chosen to “pay no attention to the man behind the curtain.” Thus the positive summation of the Relate Conference by the two pastors of my former church, Sovereign Grace Church of Gilbert. Mahaney is attempting to live on the “spiritual equity” of former days. Unfortunately for him it doesn’t work like that in Christianity. The result is we see a little man desperately attempting to remain important. His jokes aren’t funny, his brown-nosing is repulsive and his sermons, once fresh words from the Lord, now are like leftovers warmed up and re-served well after their useful shelf life. That is a good way to put it Mahaney attempting to live on “spriritual equity.” Hopefully one of these days more people will start to realize that. Hey Buddy!, I found this information for you: "C.J. Mahaney Once Again Displays Minimal Effort". Here is the website link: https://thouarttheman.org/2014/01/18/c-j-mahaney-once-again-displays-minimal-effort/. Thank you.